Water Clarity - Widely varying, lots of muddy river water in places, while some bayous had 4' of clear water. After a long and foggy drive, we launched a few minutes before 7am out of Beshel's Marina and got a nice view of the sun rising as we paddled up Grand Bayou, headed NE. Our hopes for finding trout were already tempered to a good extend by the doubt the old timers at the launch had that we would find any in close, and the obvious influence of the river water on the area - hyacinth and muddy water abounded. Nevertheless, we pushed on for several miles, ending up in Battle Ground Bay. The tide was really rolling out at a good clip, and it wasn't too hard to push 4.5 mph in the current. 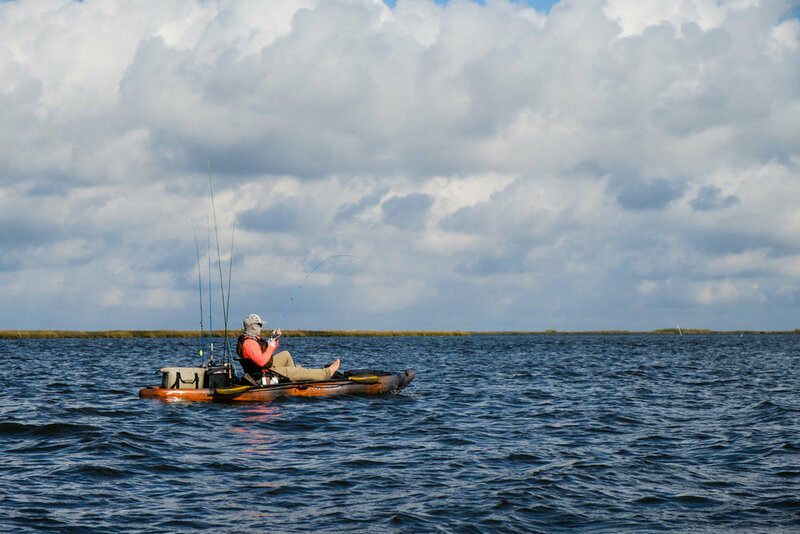 As we came out of the bayou into Battle Ground Bay, it was pretty clear that (as usual) the wind forecast was off by a few MPH, and the wind was battling the tide, creating that uneven chop that is such a pleasure to paddle in. With that in mind, we decided not to head too much further East away from the marina (into the wind), as had been our plan. We worked a few island points and choke points where current was concentrating the water and theoretically bait, although there wasn't a huge amount of obvious bait activity, and were able to find a few fish that were right around the legal mark, and a few under. Not the fish we were looking for! That area involves some pretty good paddling distances, and it was a bit of a dilemma in deciding what to do next, considering conditions weren't looking favorable for a good trout bite, and it was inching closer to the late morning time that they tend to slow down feeding anyway. We decided to keep fishing the shore and points of the island we were on, and work our way towards a few ponds that I had seen on the map and wanted to check out. The journey to the ponds took a detour for a few minutes when Josh hooked into a good size bull red on his trout setup. "YEAH, THAT'S NOT A TROUT"
When we made it to the ponds, I was really surprised at the water clarity - we're talking count the scales on the fish kind of water clarity, with a lot of snot grass and other vegetation still alive in the ponds, which were well protected from wind and only had narrow entrances. The extreme clarity of the water, along with the stiff wind actual made sight fishing pretty tough, as the ripples on the water made it tough to see the fish in time to get a cast off, and the clear water made the fish extremely skittish and aware. I did manage to get two in the first pond - nice golden fish! It's amazing how much redfish vary in color - if you look at the bull redfish Josh caught a few minutes earlier, it's not nearly as golden. We never did run into any more trout, although we did find some other areas with astonishingly clear water and a decent amount of redfish. One small bayou we paddled through was 4-5' deep, and you could see the shells on the bottom, as well as the occasional redfish swimming along. I just couldn't get a cast off in time for the lure to sink down that far in time for the fish to see it. If we weren't in the exploration mode, I probably would have just posted up there and waited for more to swim through. As it was, it was pretty incredible to watch them swim along several feet down, totally unaware that we were above them. I wish I had my camera out for those moments!!! Eventually we found a feature that seemed very fishy, with a deep center channel rising to 1.5 feet. Right off the bat, I pulled up an unusual fish - either a white or striped bass, which was a first for me. I'm not enough of an expert to know the difference, although my first thought is that it is a striped bass. Almost as soon as I got my lure back in the water, I had another hit and a momentary fight before losing the fish. Knowing it had been a pretty good fish, I was irritated, and it didn't make it much better that only a few seconds later, Josh pulled in an 18.5" flounder - my fish, if you ask me! I told him I just got the fish hungry for him, so he owed me. From that point out, we each caught a couple of small redfish, but no more striped/white bass or flounder, and called it a day not too long after that. It was great to find some crystal clear water, although it probably isn't an area that I will visit too often, considering the paddle - 18 miles in total. The unusual bass I caught, as well as Josh's flounder and bull red made something out of the day, and it was good to check out a new area. I spent a lot of time watching the depth finder, as there are some deep channels up to about 18' out that way. Even when conditions aren't great for fishing, using the depth finder is helping me figure out the way the marsh works, and where ledges/drop offs and channels are. For now, I think this location is off the table until the river level drops and some of the river water is replaced by saltier water.